It's hard to believe that another month is almost over. 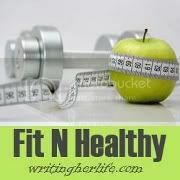 But, alas, June is coming to an end and the second month of the Fit 'N' Healthy Challenge is almost behind us. How did you do on June's goal to try at least one new exercise activity each week? Did you find any new exercises that you've incorporated into your regular routine? Were there exercise activities that you know you'll never try again? What was your favorite new exercise? When I chose June's goal, I did it because I needed some motivation to get out of my exercise rut, which amounted to 30 - 45 minutes on the elliptical and the occasional outdoor walk as many days as I could manage. I had hoped to try out some new classes at my gym, maybe get on a few new machines, and try a couple of new exercise videos. Unfortunately, the classes I was hoping to try didn't fit into my schedule, and it has been way too hot here in Baltimore to even attempt doing any exercise in my living room. Despite those challenges, I managed to add a few new exercise activities to my routing. I tried out new programs on the elliptical and treadmill. I even got on the rowing machine and stairmill and gave them a try. I'm planning to continue this challenge into July and work on arranging my schedule to try out some of those classes I've been missing out on. The best thing about these last two months of the Fit 'N' Healthy Challenge is that I feel like I've really gotten into a fitness routine. I'm exercising regularly and actually *gasp* enjoying it! Now that we've had a couple of months to practice getting fit, I thought we'd shift gears a bit. For July's Fit 'N' Healthy goal, we're going to work on our eating habits. It's summer, and that means it's the perfect time to start eating more fresh fruits and vegetables. Since I gave up meat, I don't have much of a problem eating plenty of fruits and veggies, but sometimes the variety is a little lacking. Keeping that in mind, I'm making this month's goal two-fold. Eat at least 4 servings of vegetables each day and incorporate one new-to-you veggie each week. I'd highly recommend you head to your local farmers' market and get creative. Try some kohlrabi (these easy kohlrabi refrigerator pickles are delish). Saute up some Swiss chard. Pick up some heirloom tomatoes and make a refreshing salad. Have fun exploring new foods and dishes. And don't be afraid to chat with fellow shoppers or the farmers who grew the veggies. They'll always have recommendations and suggestions on what to try or how to prepare it. Let's have a Fit & Healthy July! If you're just joining in on the Fit 'N' Healthy Challenge, the goal is to make and work toward one fitness, health or wellness goal each month. At the beginning of the month, I’ll offer up a goal that we can all work toward and throughout the month I’ll check in to make sure we’re all on track. If the monthly goal speaks to you, feel free to jump in and join us. Just leave a comment letting me know you’re trying to get fit and healthy, too. If the goal isn’t for you, don’t worry. You can still join in. Set your own goal for the month, post it in the comments and we’ll cheer you on as you work toward your goal, too. A lot of my favorite recipes are the result of looking for cheaper and easier ways to fit protein into my meatless diet. I love the convenience of frozen bean or soy burgers, but they're not exactly budget friendly. 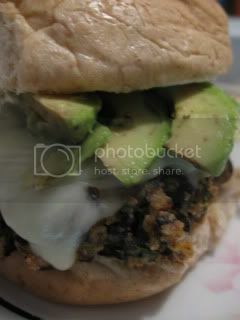 When Alana at A Veggie Venture posted a recipe for black bean burgers, I immediately gave them a try. They were delicious, so I filed away the recipe for future use -- and promptly forgot about it. Fast forward a year and I've got black beans in my freezer from the farmers' market last season that need to be cooked and used to make room for fresher veggies. While I'm slow cooking them, I start to smell grilling food and craving burgers, but not the beef or turkey kind. I start craving those black bean burgers. I pulled up the recipe and got to work whipping up a slightly altered version based on what I had on hand. 1. Heat 1/2 TBSP olive oil over medium heat in a large skillet. Add the onion, green chilies and garlic and saute until the onions begin to brown, stirring frequently. 2. Transfer to a food processor and add the cilantro. Pulse a few times until roughly chopped. 3. Add the beans to the food processor and pulse several times, just until the beans are broken up into small chunks but not too pasty. 4. Put the bean, onion, chilies and garlic mixture into a large bowl. Add the egg, bread crumbs, cumin, chili powder and salt. Stir with a fork until well blended. 6. Heat the remaining 1 TBSP olive oil in a large skillet. 7. Carefully add the burgers to the oil and cook 2 to 3 minutes on each side until browned and warmed through. I wouldn't grill them unless, as Alana recommends, you use a grill basket. They're not solid enough to stand up to the grill grates. But they are hearty and flavorful enough to please just about any meat eater. I like mine topped with pepper jack cheese, sliced avocado and tomato, and a little bit of mayo. I'd suggest you make a double (or triple) batch and freeze some for later. You'll be thankful you did. These things are addictive! 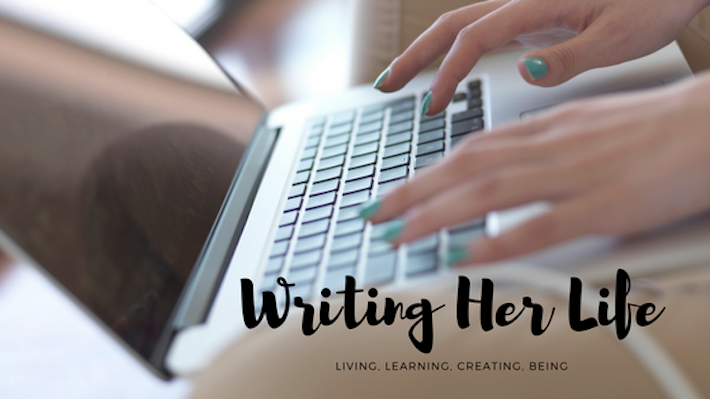 Every week I get Christina Katz's Prosperous Writer newsletter in my email inbox and I can't wait to read it. I especially love her 52 Qualities of a Prosperous Writer series, and a few weeks ago she wrote about the twenty-first quality: Authenticity. I meant to write about Authenticity that week, but as it often does, life got in the way and I'm only now getting around to it. Your authenticity is the truth about the best of what you do. So no need to ever fake it. Just be yourself. And then be a little more yourself. And then share a little bit of that with everyone else. I want to live an authentic life, true to who I am, not who I wish I were. I want to stop trying so hard to be something or someone I'm not and to focus on the things and the person I am. You would think this would be an easy task. I am me, after all. And yet, sometimes I see what someone wants or what a situation entails, and I discretely put on whatever suit the occasion requires. I'm learning to do this less often, but it's still a challenge. I think for me (and maybe for you, too), authenticity requires practice and some gentle reminders of who I am at my core. But, like getting back on a bicycle after a long time, I am beginning to recognize the required motions and the balance is quickly coming back to me. Without really thinking about it, I am suddenly riding along with the wind in my hair as though I'd never forgotten how to be me. With every opportunity I seize to allow my authentic self to shine through, I become a little more like my true self. Turns out she's pretty cool, if I do say so myself. I come from a family of weak-kneed women, and I don't mean that in the swooning sense. My mother has always had trouble with her knees, and my little sister has knee issues, as well. While a lot of that trouble may stem from begin overweight in my mother's case, and doing a lot of running and high-impact exercise as a middle-schooler and teenager in my sister's case, it's clear that the problem is at least partly hereditary. When I gave running a try a couple of years ago, I quickly found my knees weren't going to be up to the steady pounding unless I was willing to pop ibuprofen and put up with the constant clicking and crackling. And even after I stopped running, my knees never forgave me. Walking up stairs, and sometimes even plain walking, can cause my knees to pop and crackle. About a year ago, my sister suggested I try taking a glucosamine-chondroitin supplement. She swore it made a huge difference for her, so I gave it a try. Low-and-behold, the crackling and popping subsided, although it didn't go away completely. When I came across the opportunity at FitBloggin'10 to try Elations, a liquid supplement that claimed to help maintain healthy joints and promote healthy joint function, I wasn't interested at first. I was already taking a glucosamine-chondroitin supplement, after all. What was the point in trying something new? But eventually I gave in and traded my current supplement for Elations, which includes not only glucosamine and chondroitin, but also boron and calcium. I'm glad I did. Surprisingly, within a few days of taking the daily liquid supplement my knees seemed to get even better than they had been using the regular glucosamine-chondroitin supplement. The bottled supplement, which I tried in Cranberry-Apple, Black Cherry and Raspberry White Grape flavors, wasn't my favorite. The flavors were a bit strong for my liking. I loved the powdered packets that I was able to add to my water, though--probably because I could temper the strength of the flavors with extra water. I really liked the Raspberry White Grape flavor this way. Unfortunately, once I ran out of the three week supply of Elations, I wasn't able to afford it. While I consider glucosamine supplements to be pretty pricey (I usually pay about $30 for a 90 day supply), Elations is even more so ($6.97 for a 6-pack of liquid or box of 7 powder sticks, or about $30 to $35 for a 30 day supply). If the cost doesn't bother you and you're interested in giving Elations a try, you can find it in the vitamin and supplement aisles of most stores. You can also get a $1-off coupon from their website. If I decide to start running again, I might have to reconsider Elations and readjust my budget to include it. For now, though, I'm back to taking my regular glocosamine-chondroitin supplement, and my knees are relatively happy. *Disclaimer: I received samples of Elations in exchange for my honest review. I was not compensated in any other way. The opinions and thoughts expressed are my own. I received a case of POM Wonderful 100% pomegranate juice after FitBloggin'10, and while I'm not much of a fruit juice drinker, I was happy to give this a try. After all, pomegranate is supposed to be one of those antioxidant-filled super foods. And those POM-tinis we were served at the FitBloggin' reception were quite tasty. If nothing else, I'd have plenty of juice for cocktail making. I did enjoy a few POM mocktails (1 part POM, 1 part seltzer water), but by far my favorite thing to do with my POM has been to cook it. Yep. That's right. I've been using POM in my recipes. I've made a delicious, citrus-y salad with a pomegranate vinaigrette dressing, and a pomegranate glaze that would be great on just about any protein. I used it on shrimp, but I'm planning to try it on salmon, as well as on tofu. 1. 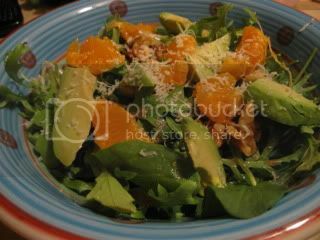 Divide arugula, avocado, clementine segments and walnut pieces between two serving dishes. 2. In a small bowl, whisk the dressing ingredients until well combined. 4. Top each salad with about 1/2 TBSP grated Parmesan cheese. I ate this as an entree salad one night, but I used the dressing on salads throughout the week. The sweet tangy-ness of the dressing is a great compliment to the peppery arugula, but it was also good over a baby greens mix and romaine lettuce. 1. In a medium saucepan, whisk together first four ingredients over low-medium heat. 2. Bring to a simmer and cook uncovered, stirring frequently for about 15 minutes or until thickened. 3. Toss shrimp with glaze and serve. 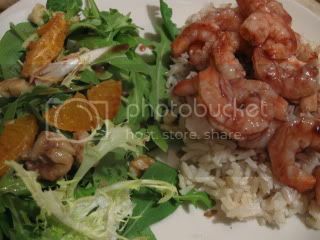 I served the shrimp over cooked brown rice with the citrus-y salad on the side. It was the perfect combination. I've been reading Magpie Girl for a while now, and I particularly love her *8Things posts each Thursday, in which she lists--you guessed it--8 things related to a topic that's on her mind. Sometimes they're moving, sometimes they're random and sometimes they're just plain fun. I've been meaning to jump in and do my own *8Things posts here, but either haven't felt particularly passionate about the topics or just haven't made the time to pull together a list of my own. When I read this week's topic--Fill 'er Up--I knew this was the week. I'm currently going through some major life change (which I'm not quite ready to talk about here) and feeling a little empty. What better time to focus on what fills me up when I feel drained? 1. Sunshine and time outdoors. I just put together a little bistro set for my back patio and my new favorite thing to do on the weekends is get outside in the early morning sun and enjoy my little flower garden, the birds, the breeze. Even a short mid-day walk (when it's not too hot) can fill me with energy and liveliness on the most draining of days. 2. Yoga. It gives me permission to center myself and focus on what's going on inside my body. I feel stronger, more focused and better able to take on whatever comes my way after a session on the mat. 3. Time with friends. There's something healing about sitting around with a friend (or several of them) and chatting about nothing in particular and everything under the sun. And there's always a lot of laughter, which is healing in itself. 4. A good book. Since I was a kid, I've always retreated to books when times get tough. Escaping into the world of a good novel or memoir gives me a break from my own worries and stress and helps me to see the world through someone else's eyes for a change. Even if that someone is fictional. 5. Exercise. I never thought I'd be one to look forward to exercise, but my body craves it. A good workout, whether at the gym or the park, can turn my frown upside down. And a nice walk with a friend makes it that much more enjoyable. 6. A phone call. Living hundreds of miles away from friends and family isn't easy, and sometimes I just need to hear the voice of a far-away friend or family member. Taking the time to make that call and have a real conversation can make all the difference in my outlook. 7. Cooking. A lot of people shy away from the kitchen, but I've come to love the meditative quality of rinsing, chopping, seasoning, sauteing, stirring, and yes, eating, a meal made from fresh ingredients. Whether tweeking favorite recipes or trying out new ones, I can't wait to get into the kitchen and play with my food. 8. Creating. Whether it's writing a new story, taking photographs, putting together a meal from whatever is on hand or making homemade cards, I love any opportunity to make something come to life. What's on your Fill 'er Up list? You can join in on this week's *8Things by grabbing a button from Magpie Girl and writing up your own list, or leave a comment here and let me know how you fill yourself up when you're feeling drained. Long before I stopped eating meat (a year ago this past weekend), I started thinking a lot about how what I eat affects me and the world around me. It started with a desire to eat more locally grown and sourced foods, but it evolved into something bigger. As I read books like The Omnivore's Dilemma and Animal, Vegetable, Miracle , I started to realize that I could choose the impact my meals have on the environment, as well as on my body. The next logical step for me was, to the best of my ability, to eat meat that was sustainably, organically, and locally raised. And as the cost of this decision weighed on my budget, I decided that eating less and less meat might be a good idea. Eventually, meat dropped off my menu radar, and I've been OK with that for a year now. Especially after watching Food, Inc . When I heard about Alicia Silverstone's book, The Kind Diet , I figured it was right up my alley. In it, she shares the information and arguments that eventually convinced her to shift from a vegetarian diet to a vegan diet and then to what she calls The Superhero diet, her personalized version of a macrobiotic diet. Part II describes how you can begin "Living The Kind Life". Unlike other "diet" books, Silverstone doesn't encourage readers to jump into an extreme diet from the get-go. Instead, she describes how readers can "Flirt" with eating a kinder diet, begin going vegan, and then become a "superhero". She suggests you choose the plan that fits where you are now and give it a try. Then, as you get used to eating in a new way, you can increase your commitment, until eventually you're a Superhero. She makes giving up meat, fish, dairy products and processed foods seem simple, gradual, almost painless. Of course, she also encourages adding foods that are pleasing to your palate so that you don't miss those foods nearly as much. And she gives suggestions on ways that you can begin to make the shift toward kind eating if you're not ready to go all the way, and still see some of the positive effects. Part III is a rather impressive collection of Vegan and Superhero recipes. I have to admit that I haven't tried any of the recipes yet, but I am looking forward to it. Who could resist the allure of vegan Peanut Butter Pie and Mixed Berry "Cheese"cake? And then there's the Risotto with Oyster Mushrooms, Leeks and Peas, and Rice Pilaf with Caramelized Onions. I'll be sure to share them with you once I get around to making them. In the meantime, I'd recommend you check out The Kind Diet if you're interested in eating a more sustainable, healthier and, well, kinder diet. The first month of the Fit 'N' Healthy Challenge is now behind us. How did you do on May's goal to get 30 minutes of moderate exercise 5 or more days a week? Were you successful, or could you have done better? Did you actively pursue the goal, even if you didn't always reach it? Sometimes, not giving up on a goal is more important than reaching the goal itself. I managed to eek out a successful month, despite some pretty lazy weekends and a lot of rain keeping me from my midday walks. The gym was definitely my friend in May. And knowing that I'd started this challenge and people would be checking in on my progress kept me pushing toward 5 active days a week. Thanks to my fellow challengers for that motivation! This month's goal is targeting my personal tendency to stick with what I know. Inevitably, this leads to exercise boredom or an activity rut. Then I'm more likely to skip the exercise altogether instead of changing it up. So to jump start my fitness routine and get me out of my comfort zone, I'm encouraging a little exercise adventure. Try at least one NEW exercise activity each week. We're building on May's challenge, so keep exercising at least 30 minutes, 5 days a week. But this month, try adding in some new exercise activities. It's summer, so there are plenty of options out there. Get a group together, head to the park and play Frisbee, touch football or soccer. Take the kids to the pool and swim some laps. Or try a new fitness class at the gym. (If you haven't tried Zumba and you can find a class near you, I'd highly recommend it for a fun way to burn plenty of calories). Let's have a Fit & Healthy June!